Have You Included Intense Moisture in Your Acne Fighting Strategy? Typically, when one thinks about what to do to attack and eliminate acne, the first thought that comes to mind is how to dry out pimples. Drying out pimples isn't necessarily a wrong strategy but is it the absolute best way to create healthy skin? Perhaps there's a completely different approach that can both eliminate acne while promoting glowing skin at the same time. The inspiration came from a post from IG influencer, @signedblake. She suffered from a severe acne breakout. Blake's plan of action was simple, purchase products that address the active breakouts and combine intense moisturizing. Her acne fighting product of choice was prescription strength Differen Gel. But she didn't stop there, around the same time, Blake switched moisturizers. Instead of relying on a cream based moisturizer, she opted for one of the most hydrating products on the market. I'm no stranger to the Hada Labo brand. Hada Labo is a Japanese based skincare brand that boasts of having the #1 face lotion product in Japan. The hero ingredient you'll find in most of their products is Super Hyaluronic Acid (SHA). What makes their hyaluronic acid super is that it has twice the moisture retention potential of regular HA. The difference between super HA and the typical HA found in most products is that Habo's Super HA anchors to the different layers of the epidermis. Because it can penetrate various skin layers, super HA can moisturize more effectively. With super HA in your life, your skin becomes softer, smoother, plumper. If you're familiar with the Hada Labo brand, you're probably aware of their liquidly HA lotion. This product is great but they've made it even better. 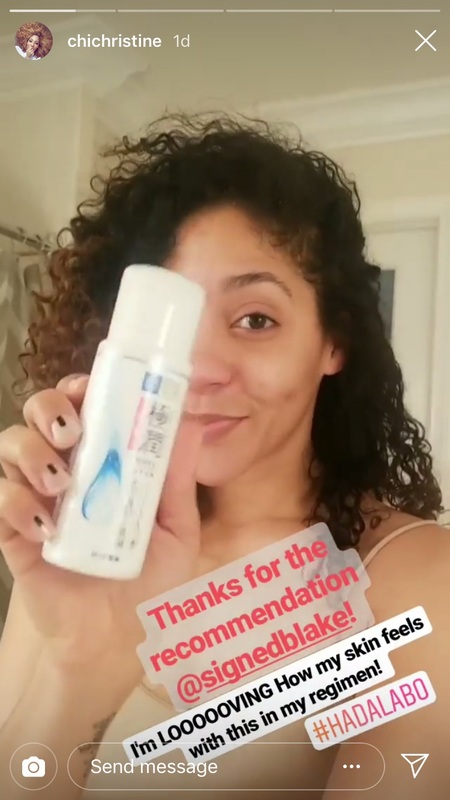 When Blake revealed that Hada Labo's Hyaluronic Lotion Milk helped transform her skin, I was all ears. Even though I've never tried the product, I knew for a fact that a milkier version of the product would hydrate on a massive level. 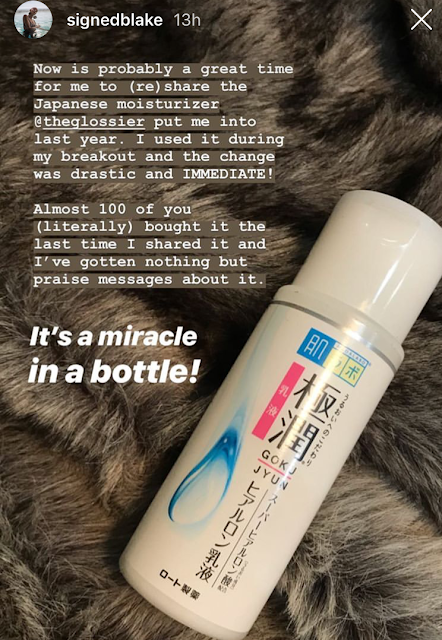 Blake actually referred to it as a miracle in a bottle. 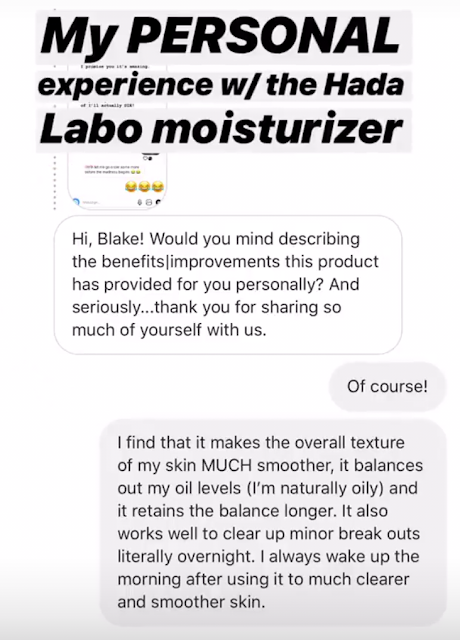 When one of Blake's followers inquired about the benefits she experienced after using Hada's Super HA, Blake noted that it worked to clear up minor breakouts literally overnight. Someone sent Blake a DM detailing how she uses HA milk at night and always wakes up to softer skin. If going to bed greasy isn't your thing, going to bed ultra-hydrated might be everything you ever wanted. One of the most obvious benefits of properly hydrated skin is a reduction in oil production. When your skin produced excess sebum, you're leaving the window open for potential breakouts. Oil and dirt trapped in the skin's surface create a breeding ground for bacteria and acne formation. 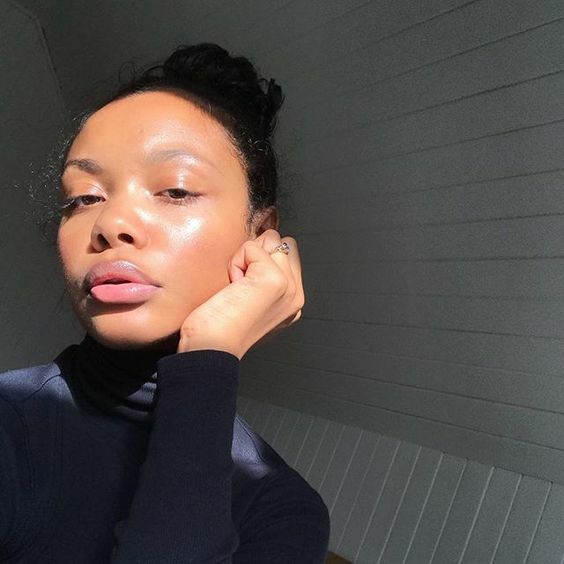 If you ever look closely at the close-up selfies featuring beauties with flawless skin, one thing they all have in common is how hydrated and moist their skin looks. No signs of dryness anywhere. My skin always looks its best when I pay close attention to my moisture levels. Normally, I have to remoisturize throughout the day to stay hydrated. But this HA moisture milk seems to have some serious lasting power. Blake's testimony and the feedback from the reader, made me take the plunge and grab a bottle of this milky lotion. Now I'm just counting down the days until this ultra-hydrating skin replenisher is mine! I'm super-excited about the fact that this appears to be a superior product for hydrating overnight. Hopefully, Habo's milky moisturizer is lightweight enough to use in summer as well. The plan is to use keep my skin as hydrated as possible to manage oil production and keep my pores happy. 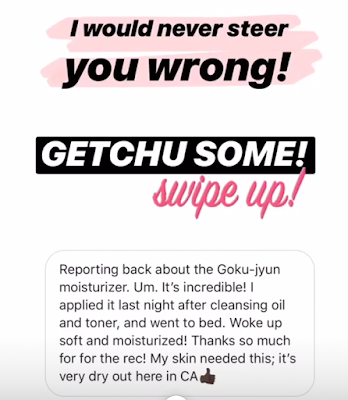 Also, who doesn't want to wake up to soft, moisturized skin? I just purchased it and a alkaline filter!! I love this blog! I never considered adding more moisture. Thanks for the tip! Stop Setting Goals, Start Raising Your Standards. Break The Habit of Living In Auto Pilot.